Style, Class and plenty of Brass! 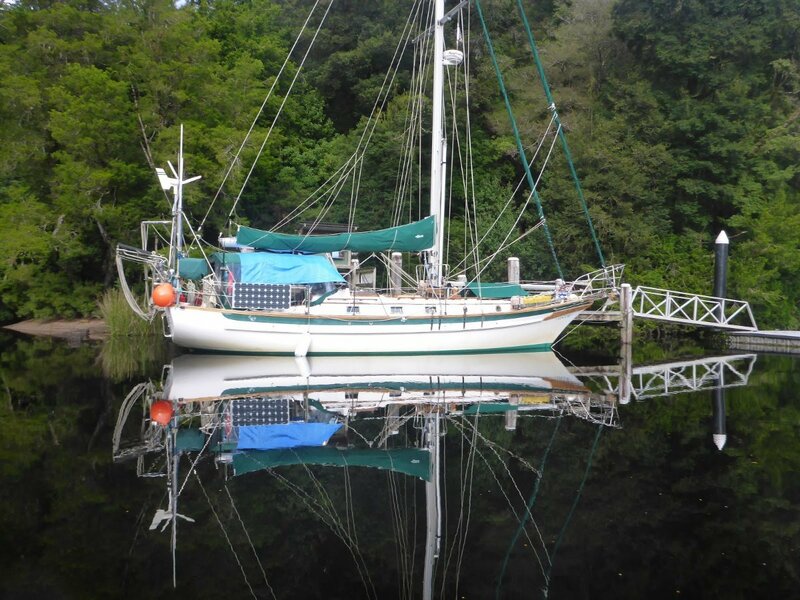 We are selling Venture, our beautiful home for the past 6 years and a boat that is a rare treasure in Australian waters. After over 10,000 miles sailing on the South and East Coasts of Australia as well as a circumnavigation of Tasmania, we are now looking to move to the next part of our life experience. This is a boat to take you safely anywhere in comfort! Venture is a Cabo Rico 38, a true blue water cruiser. The designer (Bill Crealock) said in his design notes "The Cabo Rico 38 hull shape is the one in which everything came together best. ". She's a dry boat with the clipper bow pushing water aside so the cockpit rarely gets wet. Under full sail when the wind reaches around 10 knots, she quickly reaches 6 knots through the water and is very stable and sea kindly. There's no "whippy" motion and everything seems to happen in slow motion. She's very easy to handle and can turn in her own length in a marina fairway if required. The beautiful, deep sheer lines make it very easy to step off the boat onto a floating dock. The solid full keel means she tracks well and the sail plan gives a lot of options for all conditions. Her interior is full plantation grown Costa Rican teak that, unlike many timbers, lightens with age to honey hues and becomes richer over time. The solid brass touches in the Weems and Plath clock and barometer, the light surrounds, lamps, handles, bell and even the towel rails give a touch of absolute class. Screened opening hatches above the V-berth, saloon table and nav desk, as well as opening springloaded, stainless steel portholes, allow for great air flow and plenty of light. There is ample storage including 2 hanging lockers (one near nav desk and a double in the V-berth), plus extra storage not normally found on a Cabo Rico including a hutch, extra shelving in the quarter berth and spice racks/shelves in the galley. There are several magazine/book racks for those extra bits and pieces. She comes complete with many, many spare parts and tools, maps, books and East Coast and Tasmanian cruising pilots. A detachable custom made Sunbrella canvas bag on the foredeck is home to the drifter and spare sails. The cockpit has custom made vinyl cushions (easy cleaning) and a fold down/fold out table (plenty of room for 4 people). The fully enclosed cockpit acts as an extra room and is a lovely place to enjoy sundowners on a balmy evening. A spreadsheet is available with all technical details, paper chart list, fuel usage, list and location of spares and tools carried on board and full maintenance history going back to 2001. Paper manuals for all the boat systems are also carried on board. Caribe Light 8 with chaps recently re-stiched. On davits. Fully enclosed cockpit, full boat shade covers, Mack Pack lazy mainsail cover. Front hatch cover. Separate shower plus cockpit shower. TMC Electric new December 2013, Motor and pump replaced Feb 2018, hoses replaced 2013. Media Centre connected to Pioneer car radio and Kogan 12V LED TV. New cockpit speakers installed December 2016, Bose speakers in Saloon. U shaped galley with safety strap. Deep double sinks, Overhead cupboards, 4 drawers, under-sink cupboard. Deep storage bin. Cupboards and storage behind stove and sinks. 12v Danfoss Dometic. 3 levels of storage. Hillerange gimballed 2 burner propane with oven. One 4.5kg and two 2.5kg aluminium propane tanks with shutoff solenoid in locker. The deep scuppers and handrails make moving around the boat very safe. Horseshoe life ring and rescue sling. Rule automatic pump and Whale manual in the cockpit. Out of service 6 person life raft. 4 inflatable adult life jackets. Shore power is delivered through an isolation transformer. The transformer can be switched to deliver 110V internally from either 240V or 110V inputs. Vectron Multi Plus 3,000W inverter/charger installed June 2017. Secondary 1,000W inverter installed for 240V appliances. Ample mains and 12V sockets throughout the boat. House bank consists of 4, Trojan wet cell batteries (total 520AH) replaced in 2015 with a Link battery monitor above Nav Desk. 110A Balmar alternator (with spare) and Balmar 3 stage regulator. Total of 300W of solar charging in three panels connected through a Blue Sky MMPT controller. KISS Wind Generator delivers 5A @ 10kts, 10A @15kts and 20A @ 20kts wind. Raymarine instruments including a C80 plotter, ST60 speed, water temp, depth and wind. Raymarine ST6001+ Auto Pilot connected to a separate quadrant on the rudder post. Raymarine 24km mast mounted radar. Separate Garmin GPS Map unit provides GPS information to VHS and HS radios. Voyager Wind Vane with mounts for the ST1000 tiller pilot if required. ICOM M422 VHF Radio with command mike in the cockpit. Spare M422 and command mikes along with a Standard Horizon second spare radio also on board. ICOM M802 Siingle Sideband HS Radio with AT-140 auto tuner and backstay aerial. Near new (2017) fully battened main sail and an old spare. Re-stitched Yankee and staysail both on furlers. 1,075 sq ft Drifter (with sock) new 2013. Stainless steel standing rigging replaced 2007 still in good condition. Folding Boarding ladder. Magma barbeque on stern rails. Arch at stern with 7DB Wifi, TV and 9DB. Venture is currently docked at Garden Island Yacht Club, Adelaide, South Australia. The club has lifting facilities for out of the water surveys. Owners are prepared to spend time with serious prospective buyers and would consider helping deliver Venture to her new home. Please, no time wasters.